We’re finally starting up again! I’ve been jealously watching the Facebook feeds of all of my friends whose orchestras launched earlier in September than ours did, and waiting impatiently for the South Bend Symphony’s first concert - and finally it’s here. We perform Saturday night at the Morris. The first half of the program is very oboe friendly - Dvorak’s Roman Carnival Overture features a big English horn solo, and the Bizet Symphony in C is an oboe diva’s dream come true, with lovely moments in every movement and a big spectacular beautiful solo in the second. The featured piece on the concert is Peter Boyer’s Ellis Island, which is more a theater piece than a traditional symphonic work. It should be a crowd-pleaser, featuring video and actors from the Civic Theater in addition to the attractive music we get to play. Not so much a big deal for the musicians, but tremendously enjoyable for the audience, and hopefully a huge seller. Let’s get this season off to a great start! Hello, Newsletter Readers! I found myself sitting at my computer planning updates for those who like hearing me perform, to those who like my reeds, and to those who take lessons from me - and decided to replan one nice big update for everyone who is the slightest bit interested. Incidentally, if you are reading this and it did NOT arrive conveniently in your inbox, from me, and you would like to periodically (every couple of months, totally unspammily) receive something like it, please click HERE and add your email to my mailing list. Once you are on it you will never be forgotten, which I cannot otherwise promise. Sign your oboe-loving friends up, too! Everything is in development and everything is in motion. I am looking forward to a full recital with the South Bend Symphony’s Wind Quintet. We’ll be at the Snite Museum of Art on Notre Dame’s campus, at 5:45 pm on Thursday, October 18. The group will perform gems from the quintet repertoire, with a focus on the music of France. The Symphony Quintet is one of my very favorite things about my position here in the SBSO. We have a wonderful, intimate musical interaction, fun repertoire, and a strong personal connection as well. Most of the shows we do are educational in nature, but somehow they never get boring with this group. I can hardly wait to rehearse and perform an hour-long program of legitimate rep! For details click HERE. Looking ahead to the spring, I will be giving a joint recital with the lovely and talented flutist Dr. Martha Councell-Vargas from Western Michigan University. Martha and I have been friends for a long time and are thrilled to be collaborating this year. We’ll do a program of works by female composers, and mostly living ones at that. Performances will take place at WMU and at Valparaiso University in late February. All details will be on my website as they become available. I have another program in my mind - a mixed chamber music performance which I’d love to do in an intimate venue here in South Bend. This program is purely speculative at this point, but rest assured that when it happens you will hear about it. is in the midst of a Back-to-School Sale! I am offering 10-15% off all finished reeds through September 30. In case that doesn’t keep me busy enough, I have also introduced English horn and oboe d’amore Blanks and Sort-Of-Scraped Reeds. By next month I plan to add processed cane to my offerings - keep an eye on that website! At the end of this month my private students will meet as a group for the first time in a performance masterclass called Barret Night. Each will play a few etudes for assembled family, friends, and oboists, with the goal of increased comfort in public performance. We’ll compare notes and award prizes, then play some more and eat cookies. This event is specifically designed to get us over the hump of walking out in front of an audience, speaking, and performing. It's a skill that can transfer to all areas of life - think of teachers lecturing, businesspeople addressing meetings, secretaries having to lead the office in a chorus of “Happy Birthday - and is obviously crucial for a musician. In addition, when we learn etudes and studies only well enough to get by in lessons, we miss that magical last step - the step in which we turn an assignment into a piece of music. Only real performance practice does that, and if ISSMA Solo and Ensemble is the only time that a student performs in the year, he or she won’t improve very fast. I've done this class before, but not in several years. I hope to have mini-recitals and oboe studio events much more frequently this season. We will have fun! Copyright © 2012 Jennet Ingle, All rights reserved. Teaching is back in my life! I’m on my second week of lessons at Valparaiso, and it is always exciting and fun to welcome a new freshman class into my studio. The first few lessons are a getting-to-know-you time for both the student and myself, and by this point I have to start developing my plan of attack. My challenge is to figure out how much to change. When I start young students, I can mold them in the right direction from the beginning. Not that that always works - but by the time I send them off to college I at least trust that they know how to blow and what the fingerings are in the high register. Incoming freshmen have LOTS of habits formed by other people. Some come in with their fundamentals all in place. They can play the oboe and just need a little encouragement and an ear to bounce phrasing choices off of. Maybe some reed advice. Those are the rare ones. We always have fun. Far more often, I have students come in who have not taken lessons before. Or who have for whatever reason developed very peculiar habits. Some are biters, who chew the reed into submission and play sharp. 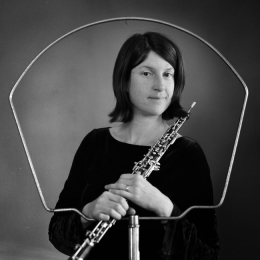 Some are tense - so tense that they can barely function as oboists. Some are unabashed non-practicers. Some have evolved a rock-hard embouchure that works 100% of the time - as long as their reeds are wide open and no one asks them to play softer, in tune, or with finesse. With these students I have to tread a little carefully. They are not children, and no matter how much better I think my approach is, I can’t just launch in and remake them on day one or week two. For one thing, they still have to be able to play in ensembles. If I destroy their functioning setup then they have weeks of struggle ahead with their conductors and colleagues listening. For another, college is a time to develop your own style. I don’t need my students to be carbon copies of me - I’d prefer them not to be, in fact - so I have to watch my own responses carefully. 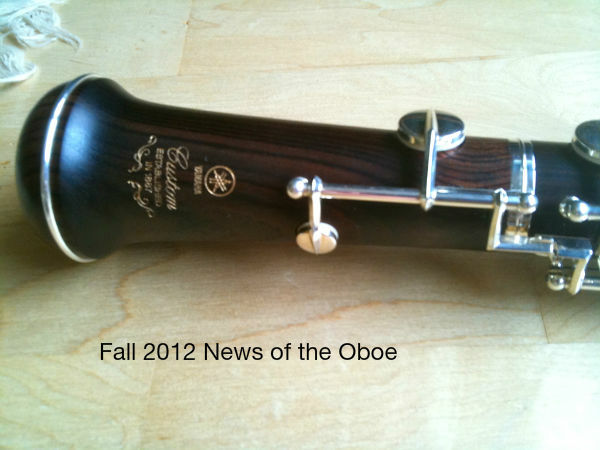 There are plenty of oboists out there, making their livings with (gasp) a different reed style than mine. Not everyone holds their mouth just the same way, and obviously there are plenty of legitimate ways to interpret any given phrase. Once I get into the rhythm of teaching, it’s easy to just boss people around. This is what I try to fight against in myself. It’s easy to say that my way is right and to make students finger, blow, and phrase the way I do. But my physical approach to the oboe is based on my own physicality, and I can’t just change what some one else has developed because it doesn’t look right to me. I have to be able to point to a specific way that my idea is better, and have the student agree, before I do that kind of dirty work. It really should be broke before I fix it. And yet, the ensemble conductors like it when their players have a uniform concept of sound. It is nice for them when all of their kids can control the instrument, play in tune and in time, and at least acknowledge printed dynamics. We grown-ups all more or less agree on the goal, and want to get there as quickly as possible. The fun is in getting the new players there without just restarting them from zero. The fascinating part of the challenge is to work with what is already there, and add the missing elements, through the back door if necessary. I need to work with the equipment they walked in with, and the skill set they have, and bump them up to College level in a matter of weeks. I love to play the oboe, but in many ways teaching is my favorite part of my career. I get to use so many different parts of my brain - analyzing what I see and hear, inventing solutions, putting those into words and metaphors that work for different people, balancing demonstrations and descriptions with letting them work things out by themselves, and doing all of those things in half-hour sessions, one right after the other all day. I come home exhausted and exhilarated.